UNIFYBroker requires a SQL Server database in order to operate. If one was not configured using the installer as described in Installing the Identity Broker Service, one must be created manually using the scripts present in the installation directory. See Prerequisites for a list of supported database engines to store UNIFYBroker’s service data. A script to create the correct database structure is included at %InstallationPath%\Database\Identity Broker Install.sql. Open Microsoft SQL Server Management Studio and connect to the target SQL Server instance noted in the Microsoft SQL Server instance section of Identity Broker Installation Prerequisites. Create a database named Unify.IdentityBroker on this server. Follow any policies that your organisation may have surrounding creation and maintenance of SQL Server databases. The database may be give any name, as long as the Data Configuration is suitably configured. TIP: See Database Recommendations for security requirements and better database performance. Open the SQL script shown above. 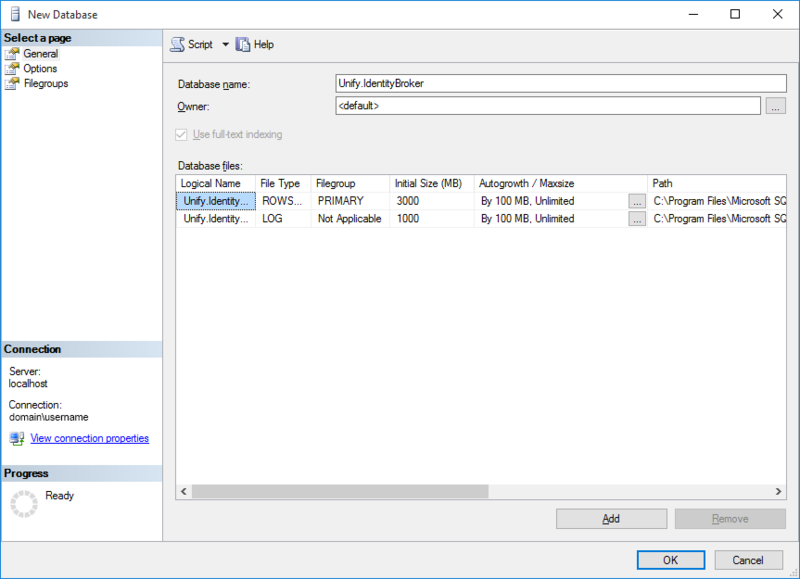 With this script open in Microsoft SQL Server Management Studio, ensure the Unify.IdentityBroker database is selected from the database drop-down box. Execute the script by choosing the Execute command from the toolbar.